In this article, I will share some tips on photographing waterfalls and hopefully teach you how to take advantage of your camera gear when photographing moving water. 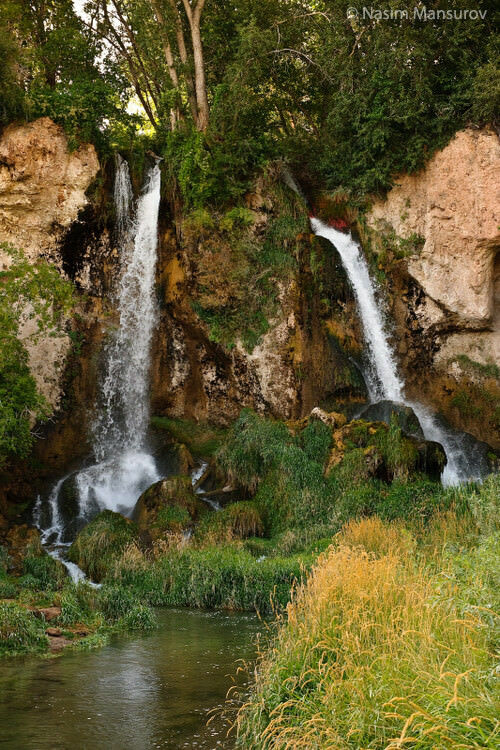 While it seems like a simple task, taking pictures of waterfalls and making the water look silky smooth can be a little challenging, especially if you do not have the right equipment. Although it is certainly possible to capture waterfalls with your camera hand-held, your best bet would be to use a stable tripod in order to allow for very slow shutter speeds without introducing camera shake. The image looks more dramatic and the silky water looks more appealing and pleasing to the eye. 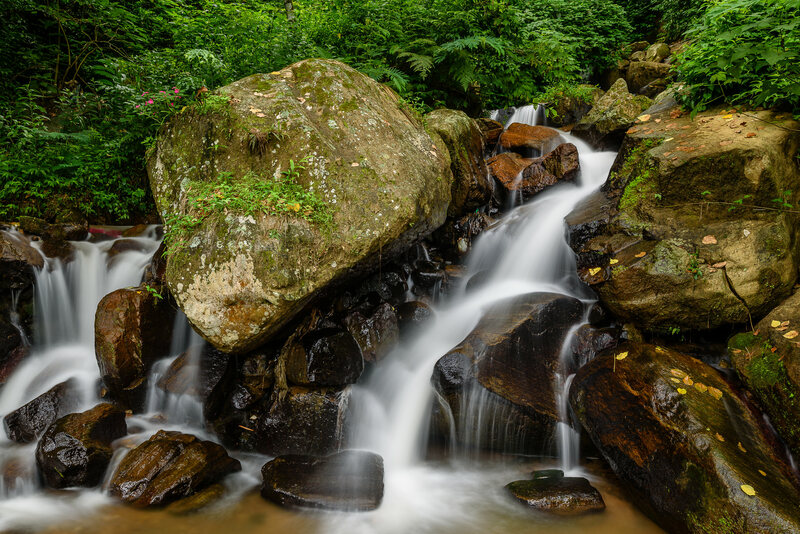 If you want to capture moving water and make it look smooth and soft, you need to use a tripod, because it is not possible to hand-hold a camera without introducing camera shake when using extremely slow shutter speeds. While you could set your camera on a stone or some other object, you would still be limited by how much you can move and what part of the waterfall you could capture. If you do not yet have a tripod, I highly recommend getting one as soon as possible – I recently wrote a detailed guide on how to choose and buy a tripod, which will hopefully help you with the selection process. Once you set your camera on a tripod, you need to continue working on decreasing your shutter speed. Lowing the camera ISO to the smallest value such as ISO 100 not only increases image quality, but also decreases the shutter speed. For example, decreasing camera ISO from ISO 800 to 100 on a DSLR decreases the shutter speed by three full stops, so if you were shooting at 1/200th of a second, you would end up with a shutter speed to 1/25th of a second. Stopping down, or increasing the f/ number, decreases the amount of light that passes through the lens. If your shutter speed is too high, try changing the aperture to a larger number like f/11 or even f/16, if necessary. Changing aperture is the last thing you can try on your camera, if you do not want to spend the money on a good ND filter (see below). If you have already tried decreasing your camera ISO to the lowest number and you have already adjusted your aperture to the largest f/ number and you still cannot get to multiple seconds of exposure, it means that you are most likely shooting in bright-day conditions and there is still too much light entering through the lens. The only way to decrease the amount of light going through the lens, is to use a filter in front of the lens that blocks a large portion of incoming light. “ND” or “Neutral Density” filters are specifically designed for this purpose – to only let a small amount of light into the lens in order to decrease the camera shutter speed. There are many different types of Neutral Density filters out there and most of them differ by the amount of light they let through. I personally use the B+W 77mm ND 1.8 and B+W 77mm ND 3.0 circular filters. 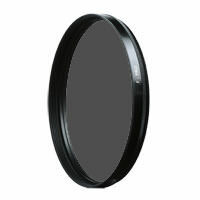 Most ND filters have a number at the end that says something like “ND 0.3” or “ND 1.8”. These numbers represent the amount of light the filter stops. For example, an “ND 0.3” filter would block one stop of light, while an “ND 1.8” would block 6 stops of light. What do these stops mean? Let’s say you changed your ISO to 100, changed your aperture to f/16 and you still have a fast shutter speed of 1/250th of a second. If you use the “ND 0.3” filter, your shutter speed will drop to 1/125th of a second. If you use the “ND 3.0” filter, your shutter speed would drop all the way to 4 seconds, transmitting only about 0.1% of light! 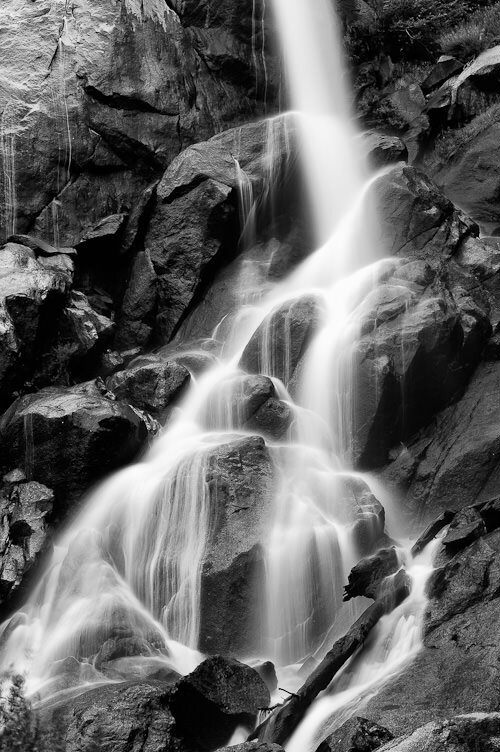 That’s a big change from 1/250th of a second freezing water action to a silky-smooth water with just one filter. Take both wide-angle and telephoto zoom lenses to photograph waterfalls. High and powerful waterfalls can release plenty of moisture into the air, which might land on the front of your lens or even potentially damage your equipment. 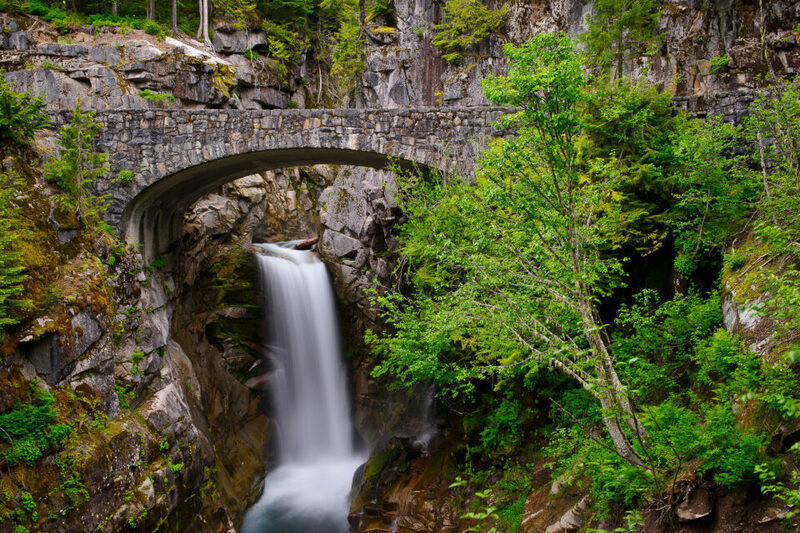 Use a telephoto lens such as Nikon 70-200mm f/2.8G VR II to photograph falls from a distance and a wide-angle lens such as Nikon 16-35mm f/4.0 VR if the falls are smaller and you are standing close to them. The opening B&W image is spectacular! Do you have any tips about ghosting people images? and how to make them look real but clear and not blurry? Kayla, for ghosting people, you should use a Neutral Density filter (something like B+W 6 stop ND filter). For making people clear, use a faster shutter speed (you might need to bump up camera ISO for that). U nd to xplan btr so ppl cn ndrstnd ur methods. thank you so much for posting this, i was having a hard time trying to figure out how to slow shutter speed and blur and i was missing the filter. THANKS! Jacob, you are most welcome! Let me know if you have any questions. how to set shutter speed to 6/1 mine only 6″ ,and how is 25/10? I’ve noticed that you talk about shooting in Aperture mode (F/16 or F/22) in order to achieve slow shutter speeds. Why wouldn’t you simply start shooting in Shutter Priority mode? And then adjust shutter speed until the desired effect takes place? Robert, the problem with shooting in shutter priority mode, is that once the aperture is maxed out (smallest or largest), your exposure will get screwed up – your images will either get overexposed, or underexposed. 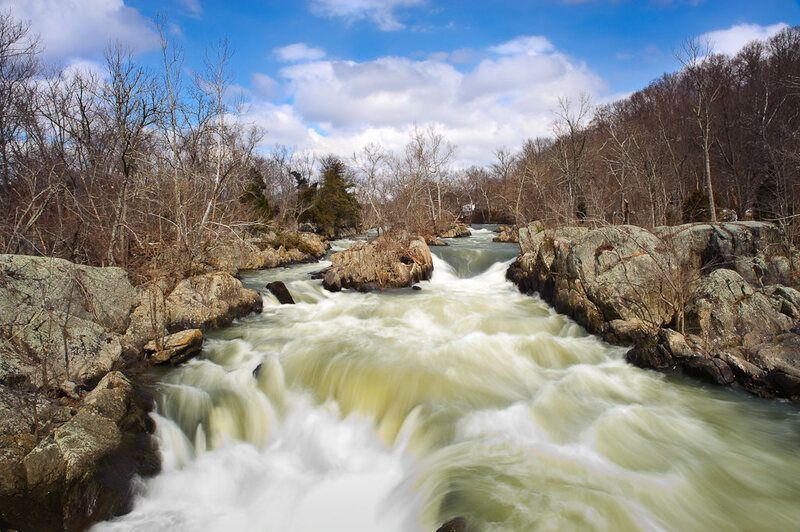 It is best to use aperture priority and an ND filter in front of the lens that stops the light. today i went to the beach, to take some photos and test my nikon d5000. there sun was shining bright. everything was just fine, but when i tried to make some slow shutter speed shoots, i was disappointed with result. images were plain white! setting was: exposure mode – shutter p. l iso-200 l f-number – f/22 l exposure time – 1/6 . nikon d5000 with default kit on it. exposure compensation changed to -5, but no luck! i know that there was a looot of light, but is there a way to get this kind shoots ? Nuran, why were you shooting in shutter priority mode? Read my response above – shutter priority does not stop down the light. It simply increases the aperture to the maximum number allowed by the lens and then the image gets overexposed, if the amount of light is too much. If you want to use slow shutter speeds during a bright sunny day, your only option is to use a Neutral Density (ND) filter. I found your website very interesting and full of useful and informative tips and lessons in a very simple words. I really enjoy reading the posts on different issues. thanks a lot for sharing such valuable information which make me more interested in digital photography. you recommended to use a ND filter in bright-day conditions to reduce light and I am just wondering if negative EV setting have similar effect and may do the job by preventing the light and letting lower shutter speeds? Nice site, good info. I am sure you would know the following tips, may be some reader can benefit. if you are looking for 1 to 1.5 stop reduction and dont have ND filter, you can use a polarizing filter that you might have. No matter which mode you use (shutter/aperture priority), keep an eye on the exposure indicator. Only that is going to tell you if the picture is going to be over exposed. If you max out on settings, your options are to use a filter to reduce light or wait for a cloud to pass by, blocking the sun. If there are trees/plants are in the picture, they will all be blur. An easy way to over come this issue is to take another picture without moving the tripod at normal shutter speed and merge them in photoshop to get the best of both. Viru, thank you for posting some additional tips, those are very useful! question here… i have a Nikon D300s and i found an option called mirro-up , for a situation same to comment No. (8) does it work if i use mirro-up instead of ND filter? if yes just please state how. How would you decrease the camera shutter speed by putting it on a tripod? A tripod has nothing to do with the camera shutter speed. & 1 more que….is that which lenses shld i buy dx format or fx format…..which lens are compatible with d5100 ^& or both lenses r compatible…..wat u recommend buying dx or fx lenses…..coz nikon gives more fx lenses priority……more lenses available……. Kautilya, I would first buy a DSLR + lenses and then start learning about the camera + exposure. As for cameras and lenses, I have many articles on this subject. Do some reading and I am sure you will find the answers. You are most welcome Kaytilya! I absolutely find your website very useful. Thank you for sharing your tips. I should’ve read this before I spent my weekend in a mountain resort. Now I’m dying to get back there and try your tips. I guess I’ll practice in a faucet first. Hehehe. I have a Sony a35, my first dslr camera. This past week was the first time i really got to use its many functions, i spent the week in beautiful Waterton National Park in Canada. I was trying to take a picture of a waterfall but could not get the silky smooth look from a distance. When i zoomed in i could get the picture i was looking for but when i tried to get the entire area surrounding the waterfall it turned out like crap. Everything on either side of the waterfall was painfully bright, almost white. Im new to the world of iso,aperture,etc so im sure i was doing alot of stuff wrong. Could this have been because i was not using a tripod? Is there a way i can post my picture? Thank you Nasim Masurov for the great explanation and sharing your beautiful photographs. I especially enjoyed the black and white shot. I will be passing on your web page information to my friends in our photo venture camera club. Thank you Nasim Mansurov for the great explanation and sharing your beautiful photographs. I especially enjoyed the black and white shot. I will be passing on your web page information to my friends in our photo venture camera club. I bought my Husband an Olympus VR-340 camera for x-mas. It has a 3 inch monitor w/o a viewfinder on the top. When he wants to take pictures of his dog hunting and all he sees is bright light, and can not focus on the subject. I am assuming he needs some kind of special filter or set his mode on the camera different. I have an older Olypmus with a small viewfinder and monitor, and it takes great outdoor pictures. I always use the small viewfinder to take my pictures and not switch over to the monitor to take them. Again my Olympus is 8 years. old and is a 10x. His is also a 10x, and that is why I bought this one. I did not pay a lot of money for it, and maybe that is what I paid for. Not a good camera. Any suggestions?? personally, I hate waterfalls that have water that looks like milk. I like water to look like water. Hi..i am a photography enthuasiast myself, started using DSLR back in 2009, before that, i had a film camera but it was too expensive to use in my country. I attempted landscape photography sometimes and waterfalls was one of my subject of interest but the photos i took were not pleasing LOL, then i realised that ND filters were the only answer…your article helps a lot..thank you. recently I bought my first DSLR (always liked photography, always lacked the financials…), a Nikon D3300 because I want to take this hobby to a somewhat higher level. A lot of things are confusing me though. What do you consider the most important piece of equipment? An ND filter (how many stops?) or a circular polarizer? Or both? Some say ND, others CP. I have become a big fan of your blog. Your lucid illustration & simple presentation with least technical language probably make the blog stand apart. It helps a lot for newcomers like me to grasp the fundamentals of photography quickly. Thank you so much for this, I am going to Plitvice Park in Croatia in May, and was panicking on how to make my pics stand out. Now, I can practice locally and take stunning photos by then. Happy days! Great advice for shooting waterfalls. You mentioned to use the lowest ISO setting and also to use a wide aperture. How will this affect other aspects of the images, such as trees and brush that may be in the photo. Will the low ISO, shutter speed, and tripod help to freeze the movement of the other elements in the photo? Thanks for taking the time to read and reply to my questions. I always shoot waterfalls with ISO 100 (smallest on my camera). With a wide aperture (small f number), you’re going to need a faster shutter speed. The effect is that the water won’t be as silky as with a smaller aperture, but your tree leaves and brush won’t be blurry from wind (which is very important to me). Another factor coming into play with a wider aperture is the narrower depth of field, which can cause more of your photo to be out of focus, so you have to also take that into account as well. I like the medium to smaller apertures to give me more of a silky water effect (compared to the wider apertures), and then I watch the leaves to snap the shot when there is little movement from wind. Best time to shoot waterfalls: (1) cloudy, so there is not too much dynamic range, and (2) no wind, so you can get the silky water effect while still minimizing motion blur in trees/brush. I also always bring filters with me: ND filters (usually 3 stop is good) to slow the shutter speed even more, or a polarizer if the waterfall has a pool at the bottom. The polarizer can be adjusted to greatly reduce surface glare in the pool. The polarizer also gives you a slightly slower shutter speed, usually from 1-2 stops depending on the quality of the filter. Thank you for the tutorial! I cannot afford the nice camera and lens you’ve recommended…would a Nikon 55-200mm f/4-5.6G VR II DX AF-S ED Zoom lens work?? Nice explanation in detail specially with reference to water fall,soon going to shoot hope to get good result. Hi sir we know both nd and gnd can stop light from entering to the camera, hence prevent over exposed area. My question is at the same time is it reduce light from a proper exposed part of a scene resulting under exposed or darken more if any part of the scene is already under exposed?